Sherry grew up in a mansion in France with her wealthy parents . While she was young, her parents were killed by Yliaster during the night. Shortly after the murders, Sherry stumbled into her father's office and saw the bodies. Mizoguchi guided her out of the building to safety. Mizoguchi continued to take care of Sherry and often moved to hide from Yliaster. Sherry moved from France to England to various parts of North America to an island in the Pacific to Japan. All the time, Sherry hung onto a teddy from her home in France. In Japan, Mizoguchi found out there had been a card hidden in the teddy. 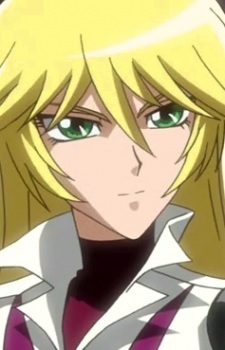 Sherry appears after Yusei Fudo gets kidnapped and saved by Akiza Izinski, from an opposing team from the World Riding Grand Prix. She forces Yusei into a Turbo Duel, by pretending there is a bomb in his Duel Runner and if he stops, it'll explode. At first she doesn't reveal her face to them. The Duel progresses with Yusei taking most damage and her negating his attacks. Then Sherry stops in the middle of the Duel. Yusei realizes her threat was a bluff, so he stops his Duel Runner too. She takes off her helmet revealing her appearance. As she does, Akiza is surprised to see a woman Turbo Dueling. Sherry reveals that her goal is to have Yusei join her team, in order to help her gain revenge on Yliaster, who supposedly murdered her parents. The duel is ultimately called off because of Ichisai's interruption, in which he tries to crush them with a truck. However, Akiza summons Yusei´s "Stardust Dragon" to escape the situation, and in the process Sherry acknowledges her as a Psychic Duelist. After Ichisai tries to leave the scene with his thugs, Mizoguchi appears to beat them up and later joins up with Yusei, Sherry and Akiza. After that they both leave, but not before Sherry stating that they meet again to both Yusei and Akiza. Sherry appears again after Akiza defeats Trudge in her first turbo duel. She has been watching and is pleased with the result. Yusei runs into her shortly after the Crash Town arc in a building with rigged with a time bomb, while she is looking for clues to her family's murder. Later on, she decides to help Yusei to defeat the Diablo that Placibo sent out to Neo Domino City, but she and Mizoguchi are getting eliminated. It is then when she decides to face Yliaster after they explaining their plan to Yusei and the others. Sherry dashes into Jose, trying to beat him down but unfortunately he tosses her away and Mizoguchi saves her.